Rass Mandal is a unique adobe vacation/retreat residence situated on a mountain range of pine forests with spectacular views. Entering brings you to another time, presenting a serene and inspiring atmosphere for all. There are numerous hiking & mountain bike trails immediately accessible, some of which take you directly to the center of Santa Fe. Rass Mandal is in a private and picturesque location, high in the Sangre de Cristo foothills, located just off the Old Santa Fe Trail yet it is only 10 minutes from The Plaza in the center of Santa Fe. The residence is situated on a mountain range adorned by pine forests. Staying at Rass Mandal brings you to another time, presenting a serene and inspiring atmosphere for all guests. Connecting with nature is easy with numerous hiking and biking trails immediately accessible from the front door. Some of the trails take you directly to the center of Santa Fe. 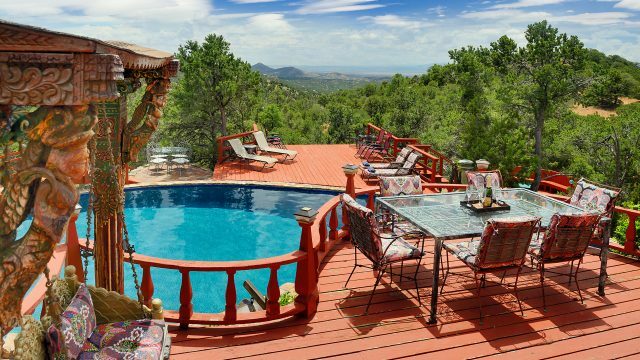 Located a private and picturesque location, high in the Sangre de Cristo foothills yet just off the Old Santa Fe Trail and only 10 minutes to The Plaza in the center of Santa Fe. We proudly host guests from throughout the United States and Overseas. Book space for your group at our vacation rental online by following this link [Calendar and Reservations]. You can view a full list of our amenities, as well as our most up-to-date calendar of reservation openings. Guests are also invited to contact Richard (the owner) with any questions or concerns. Rass Mandal was originally designed and constructed by Nyssia Wali. Wali is a direct descendant of the daughter of Emperor Akbar of India (1542 – 1605) and sister to Shah Jahan, who built the Taj Mahal. The architecture of this historic adobe home is unique in it’s fusion of U.S. Southwestern construction materials and South Asian design. Browse the pictures on our site to see its one-of-a-kind beauty for yourself. Discover the unique beauty of your next vacation or retreat location by checking out our online resources. You can go on an interactive tour of Rass Mandal by following this link [Self-guided Virtual Tour]. Use your arrow keys or mouse to navigate through the tour. It’s just like being there in person, so you can see all the details for yourself before you arrive. You can also see Rass Mandal from the sky. The video below is an aerial view of the Rass Mandal taken from our cool drone. From this vantage, you can see that the main residence is in a slightly U shape. When Nyssia Wali envisioned the construction, it was her intention to make it represent a bird, with the center room representing the main body of the bird and to either side representing the wings. The building in the lower left is the screened-in yoga pavilion, ideal for yoga retreats during the warmer months. The small building to the right is the cabin with its own deck. We are honored to receive requests to host weddings and other very special events at Rass Mandal but, unfortunately we are only able to accommodate micro weddings or events of less than 20 people in total. However, we do have a recommendation for a wedding or event venue that is only a 5.5 mile drive from the residence. It is called ‘Neptune Studio Event Space‘ and you may follow this link to learn more about it: [Neptune Event Space]. This venue is an historic site and located on Canyon Road in the heart of the Santa Fe art district. Perhaps use this space in tandem with residing at Rass Mandal. By just stepping out the front door of the Rass Mandal you can begin exploring the beauty of the Sangre de Cristo foothills. You can either hike or mountain bike the Ponderosa Ridge to Hidden Valley Road down to Wilderness Gate Road and right into town via Canyon Road or the Old Santa Fe Trail. There are so many choices to enjoy, allowing you to renew both your body and your spirit with nature’s healing power. If you are lucky, you may spot coyotes, mule deer, and a variety of songbirds and birds of prey while you are out exploring. The video below is an aerial view of the Rass Mandal complex. From this vantage, you can see that the main residence is in a slightly U shape. When Nyssia Wali envisioned the construction, it was her intention to make it represent a bird with the center room representing the main body of the bird and to either side representing the wings. The building in the lower left is the screened-in yoga pavilion. The small building to the right is the cabin with its own deck. Right from the front door of Rass Mandal, you can either hike or mountain bike the Ponderosa Ridge to Hidden Valley Road down to Wilderness Gate Road and right into town via Canyon Road or the Old Santa Fe Trail. There are so many choices to enjoy – renewing both the body and spirit! Additionally, if lucky on the walk, you may spot coyotes, mule deer and a variety of birds and birds of prey. IT WAS THE PERFECT PLACE FOR A MEDITATION RETREAT! An enchanting and serene abode of beauty, peace and harmony in which resides a many splendor nectar of spiritual awakening, presently lying dormant and seeking to arouse in man an awe inspiring many dimensional awakening, out of his present illusory existence, into an all encompassing divinity. May God’s choicest blessings be showered on the owners, Richard and his family, and all his future residential guests, and may God arouse in them a tingle of serious and divine inquisitiveness. “The dot com’ers, the “one percenters”, the Nouveau Riche, simply can not compete with the great families who transmit the best of society across generations…Rass Mandal, as with all great mansions of the patrician, gentry, and nobility classes is a media with a message that transmits cultural epitomes that are universal. Petite Trianon in scope and perhaps even purpose one can not help but be transformed. If one is both lucky and ready, the transformation will be permanent. From the hollow core silverware in the chest of fine tableware, to intricate carved wood, rose marble floors throughout, one is in the presence of master exotic craftsmen both Indian and American Southwest. In keeping with the Eastern origins of this estate, balance is literally demanded of all who enter…numerous sets of stairs with irregular pitches indoors and outside rarely have handrails and need care for each step…all the more to live in every second of experience of this marvelous world. Thank you for visiting our website! For more information regarding availability to stay at Rass Mandal and rent the entire residence, please visit the HomeAway reservations website. My name is Kelsey Ullrich and I’m the owner of Inner Circle Healing Retreats. I’m a licensed therapist and certified yoga teacher here in Santa Fe, New Mexico. I use art therapy, holistic psychology, meditation, and yoga to guide my clients on holistic healing retreats. During your stay at Rass Mandal, I can offer customized group retreat packages. These retreats not only include the above services that I specialize in but can also include unique holistic services from my team of local healers. These include Aromatherapy, Reiki, JourneyDance, Human Design Readings, Farm-Based Healing, Body Work, Private Chef Service, Ayurveda, Acupuncture, and more! This holistic healing retreat is for those seeking an experience built around self-reflection, healing, and spiritual-awakening. My name is Ana Ramos aka Ana Rifa, I am a private chef/culinary alchemist from Mexico City based in Taos, New Mexico. My flavor profile is inspired by the traditional Mexican cuisines of Oaxaca and the Yucatan, embracing a diversity of cultural flavor markers from around the world through the lens of American cuisine. I am driven by depth of flavor, color and freshness of ingredients to their fullest potential. I’ve had the pleasure to cook in Rass Mandal and would love to continue providing my services for this amazing property and future guests. Native of Santa Fe, Founder of Santa Fe Yoga Festival and lover of life. I am happy to guide you through a rooted yoga flow here in City of Holy Faith. Keisha Wixom offers well-rounded yoga classes for the body, mind, and spirit. Each carefully constructed class weaves together yoga history, philosophy, postural purpose and technique, with meditative methodology. Instruction is specifically tailored to accommodate each participant’s general health, specific injuries or conditions, age, strength, flexibility, and life circumstances. Private lessons and customized small group classes can be requested in the style of your choice; gentle, restorative, hatha, vinyasa, prenatal, or yoga nidra. Robbi Firestone, and Santa Fe Art Classes, offers private, public and corporate 2 hour painting classes for total beginners. On Location at Rass Mandal, or at her beautiful downtown studio (can host up to 35 guests) one mile from the Plaza, Robbi’s mission is to inspire beginners to unleash freedom through painting and creativity. In these 2 hours, you’ll leave with your own, unique mini-masteripiece! A licensed RScP, Robbi also offers 4 hour Vision Board/Journal workshops to enrich intimacy, deepening and connection to enrich your retreat. All supplies brought to you! Mark Oppenheimer is a Private Chef specializing in Ethnic/ Asian cuisine infused with New Mexico’s rich culinary traditions and fresh Farm to Table ingredients. He is a master of flavour and creates menus that are innovative yet simple that both meet and surpass his clients expectations. Give Chef Mark a call and create your own menu together. Click Here for Directions! Then click on Rass Mandal on the map. I am an American born in Jersey City, NJ and now living in Santa Fe after having spent a fabulous 28 years living in Europe. As the owner of Rass Mandal, I hope to provide a space where people can come to connect, respect and reflect both with each other & with nature and perhaps experience something new. I am also a full-service real estate broker and co-owner of Adobe Casitas Vacation Rentals, Inc.; a vacation rental and property management company specializing in unique adobe homes located in the center of Santa Fe, New Mexico.